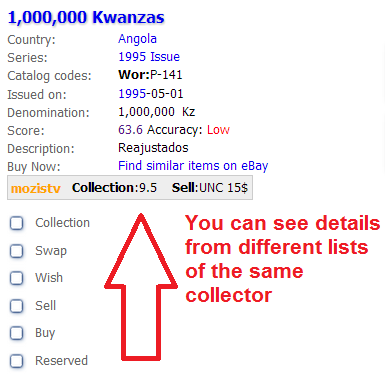 As collectors looking to exchange, trade or just look around, browsing collections of other fellow collectors- you need to look at the exact details of the items, look at the collection itself. Now this has been made easier with the help of Personal Inventory Notes. You can now see the notes made by collectors when browsing their lists. The new information that appears is the public notes made by the collector of the quantity, condition and any additional free text notes they have added about the item in their collection. Simply go to a collectors page, look at their list and you will notice that new information now appears along the item details, marked in a separated colored box. Previously, public inventory notes where only available on the single item pages of the catalog, together with all collectors that have this particular item. Now you can also see it on collectors' individual list. March has shown record growth to Colnect's collectors base. Many collectors still use Colnect without registering and enjoy the free catalogs offered on the site. Over 60,000 people have visited Colnect on March. However, to manage their personal collection with Colnect, collectors have to register Colnect. This March, as Colnect passed the 10,000 members milestone, a record growth of 11% (1,033 new collectors) was achieved. We extend our warm welcome to all new members of Colnect. Colnect is built by our members and the more collectors join, the better our catalogs will get. 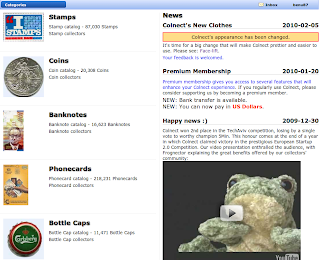 Colnect is excited to launch a brand new layout that is both prettier and easier to use for collectors! One of the most important changes is a greater emphasis on displaying only the relevant category information for a particular collector, meaning that someone who only collects stamps can easily customize their top menu bar to display only pages important for stamp collectors (i.e. : clicking on a collectors' list will show only those who have stamps). This reorganization has become particularly warranted in recent months with the addition of several new, highly-specialized categories that appeal primarily to niche collectors. In addition, numerous smaller modifications have been made that will make navigating the site more efficient and intuitive, such as checkboxes that indicate when an update is in progress and automatic redirects to item list pages. For a complete list of changes, please see the new Face-lift page. Creating the new version of Colnect entailed months of meticulous design, experimentation, and consultation with collectors. Although adjusting to the new layout may take some time and there will inevitably be some temporary glitches, we feel that the aforementioned advantages will make this project beneficial for the entire Colnect community in the long-term. Please send us any feedback you may have about these changes so that we can continue working to improve Colnect and make your collection experience more enjoyable. During the last few days, Colnect's bottle cap catalog has doubled its size. There are currently nearly 11,000 bottle caps listed. Many thanks go to Art Zhitnik who has contributed the information based on his own bottle cap collection. Art has created a bottle cap cataloging software, Caps Navigator, which allows bottle cap collectors to create their own database. Due to his organized contribution to Colnect, other collectors will be able to use the pictures and information to easily manage their personal collection on Colnect. Since the information is of Art's own collection, editors on Colnect will now work on "merging" duplicate items. It's a very common task on Colnect's wiki-catalogs since it happens that some items are accidentally added more than once. When two items are "merged", the inventory information is kept. So, for example, if a collector marked either of the items on his wish list, the "merged" item will be on his wish list. A long awaited fix to Colnect's collectors list has finally been implemented. As collectors on Colnect may collect different types of collectibles, it's important to see who collects what. The collectors list (see below) now shows it clearly. In addition, an easy-to-use pop-up selection now allows to filter by collectors of a certain collectible, for example coin collectors or stamp collectors. Following a long period of hard work, Colnect V2 is now up and running. It is a completely new version of the familiar Colnect. Its huge catalogs, from which any collector can easily manage his/her personal collection, currently include nearly 12,000 coins and over 120,000 collectible phone cards. As the catalog information is contributed by collectors, the catalog is expected to grow very quickly in the coming months. Colnect V2 is available in 25 languages accommodating for the needs of collectors from all around the globe. Go check out the site and register if you haven't so far. We're on the way to revolutionize the collectibles world.